Hartness Continuous Motion Case Packer. Capable of up to (4) lanes wide of product. Includes (2) Sets Existing Change Parts for 20 oz, 1 liter PET bottles. 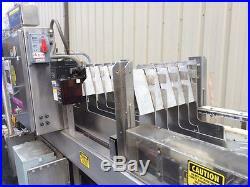 15 Wide Plastic Mattop Laning Conveyor with SEW Eurodrive Motor. SEW Eurodrive Infeed Conveyor Drive Motor for 15 Wide Belt. Change Parts Lifting Boom and Hoist. Allen Bradley SLC 5/04 CPU. Allen Badley PowerFlex 40 VFD. Electrical 460 Volt, 3 Ph, 60 Hz. Tecalemit Interlube TX Lubrication System. 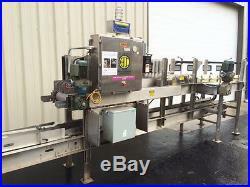 Present Bottle Conveyor Height 49 (adjustment). Present Case/Tray Conveyor Height 27 (adjustment). (10) Stainless Steel Legs with Height Adjustment. E-Stops on both sides of case packer. 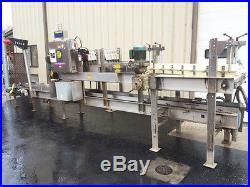 Overall Dimensions 236 L x 46 W x 76 H. The item "Hartness Model 2600 Continuous Motion Case Packer with Change Parts" is in sale since Sunday, May 14, 2017. This item is in the category "Business & Industrial\Manufacturing & Metalworking\Process Equipment\Packaging & Labeling Equipment\Other Packaging Equipment". 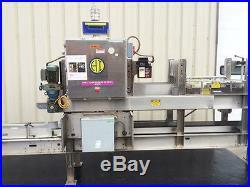 The seller is "packaging-machines" and is located in Morris, Connecticut. This item can't be shipped, the buyer must pick up the item.